In a previous post I wrote about the ancestry of John Gage who left England with the first wave of Great Migration immigrants and settled in the Massachusetts Bay Colony in 1630. He probably lived for a few years in Boston but soon removed north and was among the first settlers of the new town (plantation) that would eventually be known as Ipswich. Here is what I know about his life after his arrival in Massachusetts. John Gage is believed to have been among the first setters of the Massachusetts Bay Colony. He was the fiftieth member of the First Church of Boston. This would indicate that he arrived in the year 1630 and that he had come with the Winthrop Fleet. Although I have read multiple times that John sailed on the Arabella, the flagship of the fleet, there is no passenger list for the ship and there is no proof that he was on that particular ship. It has also been claimed that his wife Amee was on the Arabella. Not only is there no proof that she was on the Arabella or any of the other ships in Winthrop's fleet, there is no proof that John and Amee were even married at the time of his immigration. Nothing is known of John Gage and his time in Boston. The first few years of the colony were a time of hunger and hard work as the colonist struggled to learn how to survive in their new home. Hundreds died, hundreds more took one look around and headed back to England. Living in Massachusetts in 1630 was not for the faint of heart. Despite the hardships, men women and children continued to pour into Boston and Salem. There was abundant land for those with the stamina to adapt and survive. In 1633 John Winthrop the Younger, son of Governor John Winthrop, established the new plantation of Ipswich some 50 miles to the north of Boston. John Gage joined John Winthrop along with 12 or so other men on his expedition to start the new plantation. 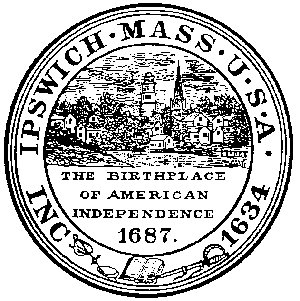 Many of my early American ancestors lived in Ipswich, for at least a time, but he was the earliest resident. It's funny to think that all these ancestors, who I know so little about, all lived together in the same town and knew, probably more than they wanted to, intimate detail about each others lives. Ipswich rapidly became a center for trade and craftsmen. My ancestor Richard Kimball, a wheelwright, was lured away from Watertown. John Gage worked as a carpenter, a trade with plenty of work. Despite having a trade, most men had to farm their land to make ends meet. Besides, land was where the money was, and the buying and selling of lots started almost as soon as they were handed out. During the 5 August 1634 meeting of the General Court of Massachusetts it was declared that the new plantation of Agawam was thereafter the town of Ipswich. At a General Court held in March of 1634/35 it was ordered that John Winthrop, John Endicott and John Humphrey had the power to divide the land belonging to the new town. With that, the business of setting up a town began. John Gage was chosen to be one of several lot layers for the town. Lot layers established the boundaries of each land grant. The land, of course, was not given out equally to all men. John Winthrop got the largest grant, he was given 300 acres in the first division of land. His land was near the wonderfully named Labour in Vain Creek. The first land given to John Gage was part of a meadow, his share was four acres. He was also allotted an additional 6 acres of land, described as "lyeing upon this neck of land the town standeth". Almost as soon as the first lots were given out, questions arose as too boundaries. The town lot layers were frequently called on to settle boundary disputes. John Gage was given various plots of land including meadows and marshes. He had land near the Egypt River and near the Chewbacco River, in what is today the town of Essex. 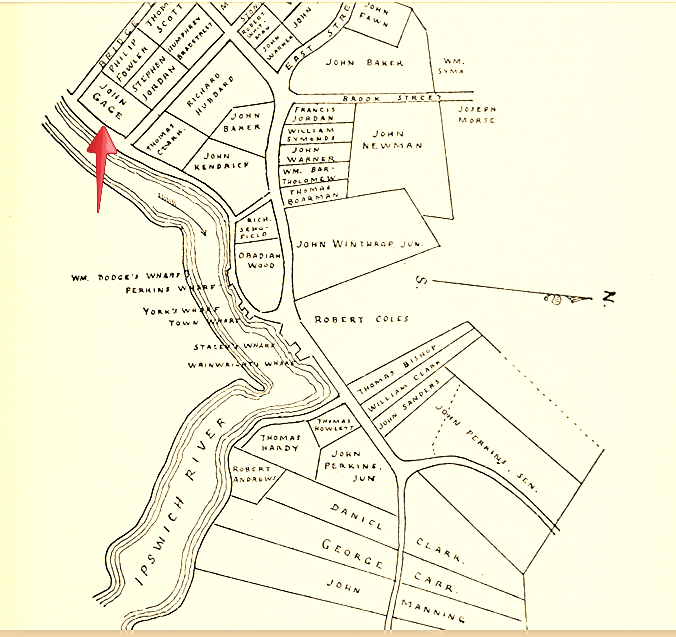 His house lot was on the Ipswich River, south of the Meeting House Green on what is today called Green Street. Ipswich has many houses that survived from his time, but his did not. John's land was where the brown house is. The first houses were probably just log cabins, sawmills had yet to be established and any planks of wood would have been cut by hand. When milled planks were available the log houses would have been replaced by something more substantial. The house lots were required by law to be fenced, and women would have their vegetable and herb gardens near their house. 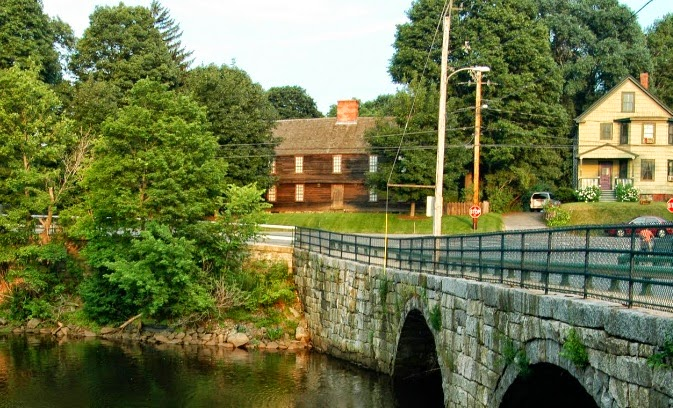 We don't know how long the Gage's lived by the Ipswich River but according to Thomas Franklin Water, John Gage built a house on his land near the Egypt River. This area became known as Ipswich Village and John Gage lived on the road to Rowley. 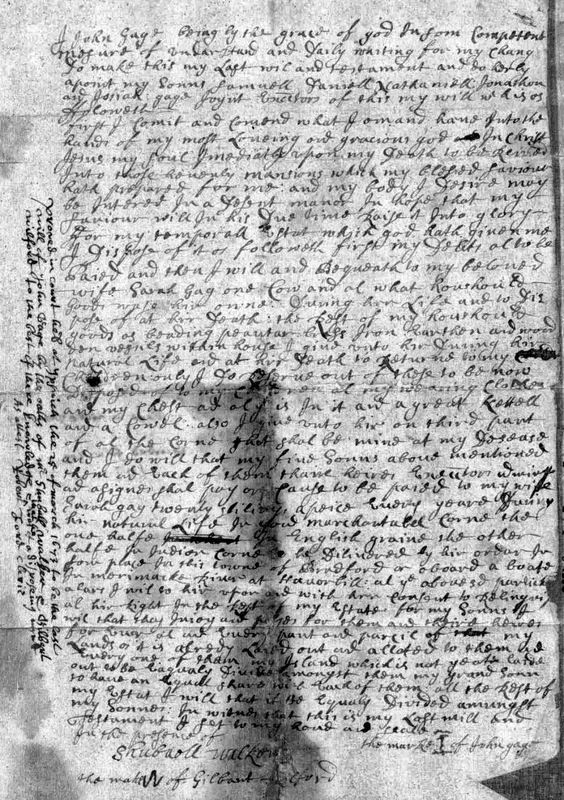 John Gage married Amee Unknown some time prior to the 1638 birth of their first child. Their marriage was not recorded nor was the birth of their child. Amee's surname is unknown. She may have been related to Henry Kingsbury or maybe she was a Wilford. In either case there is nothing other than some references to uncles and cousins, nothing definitive. In fact, the only reason we know her name was Amee was because she was named in a 1654 land deed. For me she remains, Amee Unknown. John parents are also unknown but there is a strong possibility that he was the John Gage baptized in Kersey in 1606, son of John and Jane Lufkin Gage of Boxford. If you are under the impression that John was the son of Sir John Gage and Penelope D'Arcy then please see my previous post as this is just not true. Amee and John had 6 children, all boys. All survived to adulthood, a rare feat, but three of the men died in their 30's. We don't know when Amee was born but she died in June of 1658. Her youngest son was ten. Her husband waited 5 months before he remarried. Most widows and widowers married fairly soon after the death of their spouse, mostly for practical reasons. Women needed a husband to provide for them and men needed women to keep their house and family. John married widow Sarah Keyes of Newbury on 7 November 1658 in Ipswich. Her English ancestry is unknown as is her maiden name. Sarah's first husband, Robert Keyes, died 1647, so she was widowed for a considerable time. The fact that she had 8 young children may have affected her desirability as a marriage partner and it was not until her older children were themselves married did she in fact remarry. Five years after their marriage, Benjamin, the son of John, married Mary, the daughter of Sarah. After John's death Sarah returned to Newbury, probably living with one of her children, and died there in 1705. Her probated estate contained only household items. John's land on the Egypt river was very close to the north border between Ipswich in Rowley and on today's map it looks like it is in Rowley. The borders between the towns were constantly changing and new towns were created from the large original towns. A family could live a house on the same piece of land and over the course of 50 years find themselves living in three different towns. John, as a lot layer, was frequently called on to run the border between two towns. In 1660 John began selling parcels of his land in Ipswich. In 1665, John Gage of Rowley, purchased 300 acres of land in Rowley. This tract of land was in the part of Rowley that would very soon become the new town of Bradford. Today Bradford is a part of the the town of Haverhill, MA. John Gage died on 24 Mar 1672/73 in Bradford aged about 68 years old. His son Benjamin had died the year prior, but all his other son were alive and named in his will as was his widow Sarah. He named all his surviving sons as administrators of his estate. He made provisions for the care of his wife and then divided his estate among his sons. He owned 350 acres of land plus some acreage on an Island. He must have owned more land at one time as he gave his son Benjamin land at the time of his second marriage to Prudence Lever. Schofield, George A. The Ancient Records of the Town of Ipswich: Vol. 1, from 1634 to 1650. Ipswich, MA: G.A. Schofield, 1899. Print. Waters, Thomas Franklin, Sarah Goodhue, and John Wise. Ipswich in the Massachusetts Bay Colony. Ipswich, MA: Ipswich Historical Society, 1905. Print. Waters, Thomas Franklin. Ipswich Village and the Old Rowley Road. Salem, MA: Printed for the Society, 1914. Print.